Being comfortable at your desk is an important factor in ensuring that you are working at the top level of efficiency. The Q-Connect Black and Silver Carpet Foot Rest allows increased comfort at your desk, ensuring that blood circulation is improved. 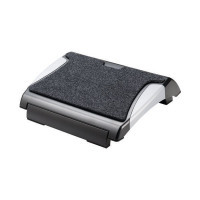 A soft surface ensures a comfortable grip and the carpet is both removable and washable for extra convenience. The height of the rest is adjustable to your specific needs, allowing everyone to be completely comfortable.